As Saddam Hussein's government fell in April 2003, news accounts detailed the pillage of Iraq's National Museum. The museum's looting grabbed headlines worldwide and public attention briefly focused on Iraq's threatened cultural heritage. Less dramatic, though far more devastating, was the subsequent epidemic of looting at thousands of archaeological sites around the country. Illegal digging on a massive scale continues to this day, virtually unchecked, with Iraq's ten thousand officially recognized sites being destroyed at a rate of roughly 10 percent per year. This book contains the first full published account of the disasters that have befallen Iraq's cultural heritage, and it analyzes why the array of laws and international conventions; the advocacy efforts of cultural heritage organizations; and the military planning and implementation of cultural protection operations all failed, and continue to fail, to prevent massive and irreversible loss. Looking forward, the book identifies new planning procedures, policy mechanisms, and implementation strategies capable of succeeding, so the mistakes of Iraq will not be replicated in other regions in crisis whose cultural heritage are at risk. Both archaeologists and policy-makers will benefit from this detailed study. Lawrence Rothfield is faculty director and co-founder of the Cultural Policy Center at the University of Chicago. He was previously the director of the Master of Arts Program in the Humanities at the University of Chicago and is also a professor of comparative literature, in which field he has three publications. 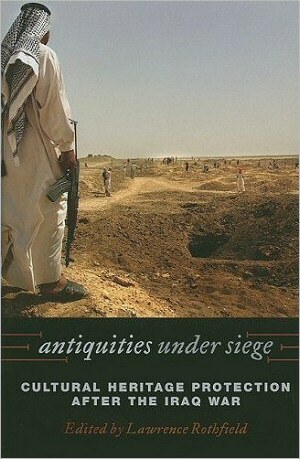 Antiquities under Siege: Cultural Heritage Protection after the Iraq War [Hardcover] - Amazon's online bookstore.